The passion fruit is native to South America and there are a number of varieties, from the large, yellow ‘golden’ passion fruit to the smaller deep purple fruit we see more commonly in the UK. 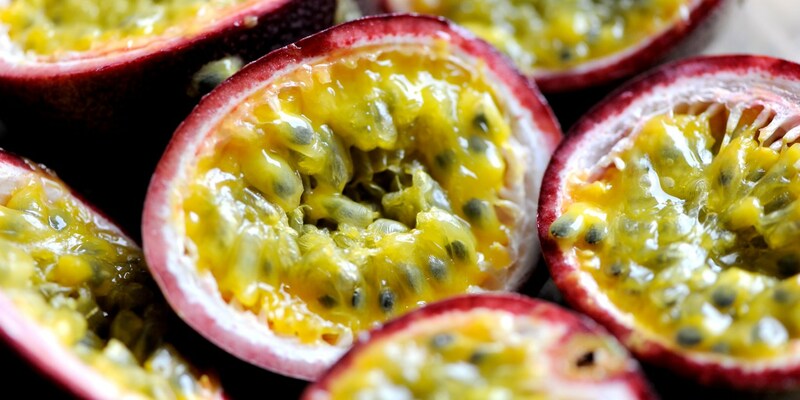 The vivid flesh of a passion fruit is incredibly juicy with a sweet tang, making it a popular addition to both sweet and savoury dishes. When buying your passion fruit look for those that are softer and more wrinkled in appearance - this indicates the fruit is more ripe. Our sumptuous collection of passion fruit recipes includes some great ideas for fruit dessert recipes, including Richard Corrigan’s vibrant Passion fruit parfait, a Passion fruit cheesecake recipe from Simon Hulstone, and a dark chocolate and Passion fruit ganache recipe from Adam Simmonds. Marcello Tully routinely works influences from his native Brazil into his cooking, and the pairing of these sweet fruits with savoury flavours is a distinctly South American approach. Try his Duck breast recipe, served with a tart passion fruit sauce, for an unforgettable simple supper.